This paper was written for the International Journal of Leadership in Public Services, Volume 9, Number 3 / 4, 2013. Health care should be exciting. Leading health care should be exciting. Caring for people with health needs should feel satisfying, worthwhile and enjoyable. In most countries, even after economic downturns, health care budgets are still the largest they have ever been, new technologies offer ever more solutions and nowadays we have evidence about what works and what doesn’t. So why do so many health care professionals not feel excited, purposeful, satisfied, valued, and good about their work? Why do leaders of healthcare organisations feel so frustrated in their attempts to ensure good care within their resources? Why, when we have ever-stricter governance and procurement procedures to ensure that money is being used wisely do we have more talk of poor care than we have heard before? The conventional answer is that demand for heath care is infinite and budgets are finite and that it is this increasing demand that puts pressure on budgets and on people. But this dissatisfaction can occur in parts of the world and in parts of the system where budgets are not constrained, so this cannot be the only reason. So what else has been happening in the world that might explain this dissatisfaction? Let’s imagine a piece of paper on which we write some of these down. Let’s start at the top left hand corner with those technological advances over the last hundred years that have led to our increasing longevity. Perhaps the main ones are clean water and antibiotics, plus all the advances that have meant many dangerous kinds of work are now done by machines rather than people. In the top right hand corner we can add the way in which politics in the western world changed about 30 years ago: changed from being primarily about reconciling different interests in society to believing that markets are the best way of doing that. The role of governments is seen now as helping markets to flourish. Another term for this is globalisation. It’s important to remember that this belief in the power of markets is just that, a belief, a theory, but it is now widely held as true to the extent that the flourishing of markets or economies is often seen as more important than the flourishing of people. Have you ever thought about the impact this has on the role and behaviour of organisational leaders? In a macho world of ruthless competition, in which companies seek to sustain and protect their markets, and organisations relentlessly grow in size through mergers and acquisitions for just this purpose, leaders are chosen for different characteristics than they were in times when it was relationships between companies and customers that were important. A reduction in creativity, largely as a result of performance being measured against predefined objectives that are then given priority over addressing creatively all the issues that emerge after the objectives were defined. We don’t measure what is actually happening, only how we are managing what is happening. Because of the difficulties in capturing the nature of ‘first order activities’ (the interactions between professionals and patients) it is not these that are monitored but second order processes or ‘proxy measures’ (things like boxes being ticked). Litigation increases because public understanding of professional decision making processes becomes distorted by league tables and other forms of news based on ‘performance’ data. This leads to the lowest risk option being privileged in any decision even where there are sound arguments for other options. Policy makers set targets for easily measurable aspects of care and local leaders deliver on those narrow targets rather than achieving them by improving the system. The factors we have been putting in each of these three corners impinge on us all, all the time, so they interact with us and each other and all sorts of changes result and go on to have impacts of their own. For example, when politicians see their role as the rational administration of the market (Wolin 1990, Iles 2011) they lose their ability to make judgements about how to reconcile different interests in society. So when uncomfortable decisions have to be made (such as what drugs should be funded by a national health budget) they delegate the decision or ‘move it sideways’, to committees of experts, taking decisions out of the political arena and recasting them in the neutral language of science (Strathern 2000). This is part of a wider fostering of a belief in ‘facts’ and ‘answers’ in place of judgement and of an ability to tolerate ambiguity and uncertainty. Organisational leaders now need to know answers, or pay consultants who have answers based on data and on ratios, instead of being able to draw on intuition and judgement. So when the digital revolution and the audit culture reached organisations they changed the nature of management. As soon as managers could reach conclusions about performance by looking at data they felt they didn’t need to manage people directly, through management conversations in which they offered support and challenge, and generally enabled people to do their best. Those conversations require work and courage so it is much easier to examine data instead. So now organisational leaders manage through ‘data dashboards’ and performance is improved through managerially set ‘targets’ that can be monitored using more data. This has also led to a radical change in governance. Now that data can be captured and held so readily it is possible to track the reasons for decisions being made, check that people have no hidden motives for reaching them, and hold people to account for decisions they make. So now everyone is aware that there is an audit trail for every decision, and behaves in ways that ensure that they cannot be censured for their part in it. Caution rules the day, boxes must be ticked, and risk can never be taken – only entered onto a risk register. This kind of management has a name – managerialism. Indeed Henry Mintzberg has called it MANAGERIALISM to emphasise how different and how dominant it has become. We could put MANAGERIALISM in the middle of our sheet of paper. In the bottom left hand corner we need to write the banking crisis that led to them being bailed out by governments who then felt the need to cut costs elsewhere. The impact of this is that budgets for public services are being cut in real terms and will continue to be for the foreseeable future. So we now have a sheet of paper with a lot of forces all interacting with each other, of the kind you can see in figure 1. But we have not yet captured a factor that drives all of the rest and must not be forgotten. That is our anxiety, the anxiety we all feel about being alive and wanting to stay that way! Our anxiety about the health and wellbeing of others. Our anxiety about surviving and thriving in the workplace. Our anxiety too about how others see us. Anxiety underlies everything else on the page, so we can best think of this as the paper on which the rest is written. 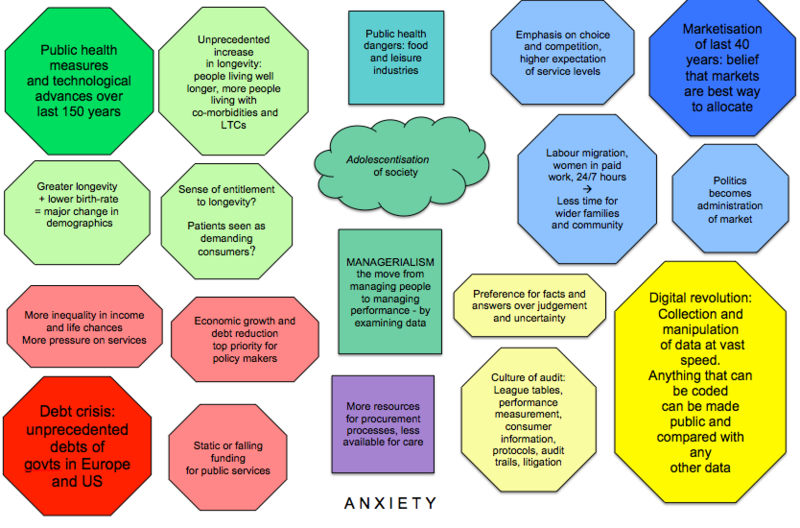 So if we look at figure 1 and imagine all those factors, driven by our anxiety, interacting with each other, we come up with a very complex picture. And if we went on imagining and adding in all the local factors that affect each one of us the picture would get very busy indeed. This is the world in which we are each trying to live and work and lead. If we think of each of these factors as a wind, we are constantly buffeted this way and that by those winds. Sometimes we can find these refreshing, and often we can find it uncomfortable. And the winds are constantly shifting and swirling around us in different ways, mixing with each other or counteracting each other in a great swirl that catches us up and moves us along before dropping us down again. We can struggle to keep our balance in this wind swirl. We must remember that the swirl isn’t anybody’s fault. and that a lot of good results from it. Nevertheless there is always a danger that in the swirl, and in our responses to it, something of value will go out of the world. So it is important that we fight for the things we see as valuable. And we must remember that we are all struggling to survive and thrive, to keep our place in the world, and in our struggle we may jeopardise things that other people value. I suggest this is an important point: we are more effective if we focus on what we want to protect, and how we can do so, what dangers it faces and how we might fight them, than if we waste our time and energy hating other people who are also caught up in the swirl. Currently all too much energy is caught up in blaming other people in the system. So, what is it important to protect? What is in danger of disappearing? Where do we need leadership attention? In a recent Learning Set (Iles 2011) spanning a two year period a group of thoughtful senior NHS practitioners and academics came to the view that when we treat healthcare exclusively as a market, and see health care as a set of auditable transactions within that market health care takes on a particular character. We tend to forget that a market economy is not the only kind, that there are also gift economies in which behaviours are rather different. In gift economies people gain in status not by how much they earn or acquire but according to how much they give away. In market economies things have a value, a value that can be compared with that of anything else and the value is usually expressed in monetary terms. In gift economies things have worth, and worth cannot be compared with anything else, it is intrinsic. A Rembrandt painting for example cannot truly be compared with anything else, it just is as it is. So too a Bach concerto, the sun and wind on your face on the top of a hillside, life, pain……. . And in gift economies too people labour whereas in a market people work. Work involves skill and time and effort whereas labour involves giving something of ourselves as well. We could describe health care in a market economy where it is a set of auditable transactions as ‘transactional care’. Care that includes elements of the gift economy (while also including those auditable transactions) can be thought of as a covenant between care receiver and giver, so we could call that covenantal care. It could also be called relational care but I have noticed that people who do so tend to think that the auditable transactions are not as important as the relationship, whereas the members of the learning set that developed this distinction felt strongly that a covenant of care included both a relationship AND effective transactions. Clearly good care will sometimes need to be a covenant and always need to include effective transactions. So deciding when to focus on efficient effective transactions and when to allow space and freedom for the gift element of the covenant is important. So we all need to give enough attention to ensuring that effective protocols and guidelines and streamlined processes are in place where there is good evidence for them, and if we do that we create the space to be able to engage in the covenant where it is needed and yearned for. Good policy ideas MUST degenerate as they are translated at every level of the system into a series of measurable, performance manageable actions and objectives. The focus here is on being able to demonstrate the policy has been implemented. Policy ideas can stay rich and be added to creatively, so that solutions are responsive, humane, practical, flexible, and adaptable. Here the focus is on implementing the spirit and intent of the policy. There is a tendency for health care professionals to look at these two columns in figure 2 and say that they want to offer the right hand column but the wicked government or wicked managers are insisting on only the left hand column. As a learning set we had little sympathy with this view. We believe that for managers and policy makers to pay enough attention to the right, care professionals have to pay enough attention to the left. That kind of mutual blame is one of the reasons why we have so much energy being spent on the audit activities that feel so onerous and time consuming to those who want to spend their time on care. It is an example of the way in which we can each so easily contribute to the winds by our responses to the situations we find ourselves in. But this is a paper in a leadership journal, what has the swirl of winds and these two different kinds of care to do with leadership? There are many different definitions of leadership and the one I find most helpful is that it is an outcome of the interaction between the leader, the led and the situation. In other words, leadership emerges, it isn’t what shapes the interactions it emerges from them, and the style of leadership that emerges tells us as much about the situation and the people being led as it does about the leader. We saw earlier that individuals are striving to deal with the swirl of winds, and the ways we do so depend on the behaviours and emotions that have developed through our genetic makeup, our early upbringing and our life experiences. Organisations too have organisational behaviours and responses, developed through their history, geography, socio-demography, and more, and these place them in a particular position in the swirl. Leaders can influence very few of these things, so organisations do not behave at the direction of a leader, it is the other way round. They and the wider system they sit within, allow the leader a range of leadership behaviours and options. Pretending that leaders control their organisations could be likened to trying to wallpaper over a volcano. For a long time as the volcano is quiet it will look as though the wallpaper is containing the volcano, as though the leader is leading the organisation, when it erupts we realise how futile and foolish was our attempt, either to wallpaper or to lead. People who rise to the top of organisations are highly skilled MANAGERIALISTS and MANAGERIALISM, as we have seen, prefers numbers to relationships, and data to conversations. Relationships involve dialogue (genuinely taking an interest in the needs, ambitions and views of others). MANAGERIALISTS prefer discussions in which each side argues their case. They are of course excellent at winning these, exhibiting the ‘skilled incompetence’ that Argyris and Schon so perceptively observed (Argyris and Schon, 1996, Argyris, 1994). But if good leadership is to emerge, leaders must not impose their own views or their own vision. This is equivalent to gluing the wallpaper to the volcanic rim. They must listen, understand, and identify with the concerns and enthusiasms of others. They must respect the power of their organisation’s history, geography, place in the wider system, and understand how these shape the options available. They may think wider and deeper than those they are leading, and develop options that have been missed or ignored because those involved have not been able to do so, but they cannot magic away attitudes and behaviours that have been shaped by decades. They need to be clear about kinds of behaviour that are helpful and those that are not, and engage in face to face conversations with those exhibiting the latter. Indeed face-to-face conversations will be how they lead. Leading is a highly personally engaging activity, involving the essence of who you are. ‘Labour’ indeed, as well as ‘work’. So we could suggest that effective leadership often involves elements of a gift economy. A few paragraphs ago we considered the difference between care that is transactional and care as a covenant between giver and receiver. Suppose we applied that distinction to management and leadership? Again, sometimes a transactional approach is all that is necessary – scheduling rosters, allocating tasks, and monitoring progress against deadlines on a simple project – , but often a covenant between leader and led or manager and staff will be essential. Personally I do not distinguish between managing and leading, I prefer to think of ‘relying on’ people, it gives a different flavour that I find more valuable. So I resist the idea that management is described in the left hand column and leadership in the right, but certainly leaders do need to see their remit as a covenant and not merely a set of transactions. Seeing people as people and not as a label ( a patient, worse a demanding patient; a nurse, a manager…) and seeking to understand how it is they see the world. We must remember too that we can so easily undermine this covenant of leadership. By demanding to know who is to blame when we hear of a tragedy, by demanding to know for sure things about which it is impossible to be sure (for example which school or hospital or doctor is better than another), by angrily demanding retribution from someone who made difficult decisions in a situation where the way forward was not at all clear. Whenever we do these we are contributing to the loss of that precious gift economy. So if we want to nurture and contribute to good leadership in health care, if we want health care to feel exciting and worthwhile for all involved, we must seek to understand rather than blame, be prepared to tolerate uncertainty and use our judgement instead of insisting on definitive answers, encourage and participate in conversations in which people are supported in working well, challenged if they are not and enabled to be the best that they can be. We cannot leave it to leaders. Leadership is our collective responsibility and we must each play our part in it. This article is copyright Emerald Group Publishing and permission has been granted for this verison to appear here http://www.reallylearning.com/what-is-happening-to-leadership-in-health-care Emerald Does not grant permission for this article to be copied/distirbuted or hosted elsewhere without the express permission from Emerald Group Publishing Limited.